From July to September, Small Scabious produces its blooms – soft pastel mounds of LAVENDER BLUE on slender wiry stems that bend and blow in the breeze. 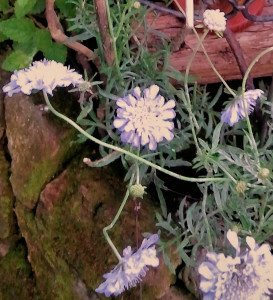 This is a wildflower that loves sunshine and good drainage, growing in the wild in dry and grassy places. Deadhead to prolong flowering. 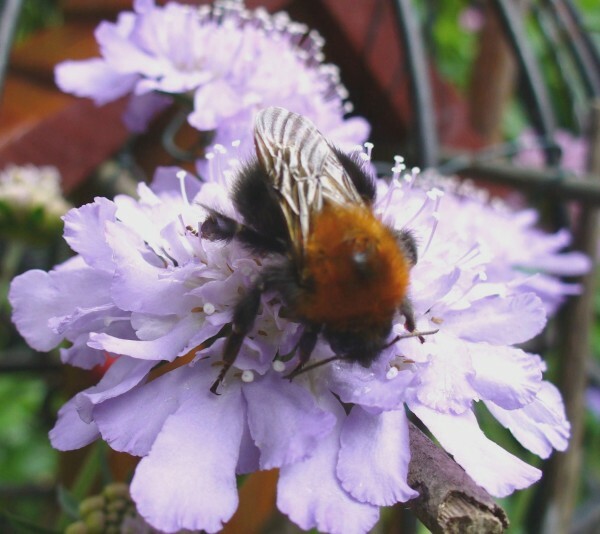 Scabiosa Columbaria is a valued nectar plant for bees, butterflies such as the Comma, and moths such as the Six-spot Burnet Moth. 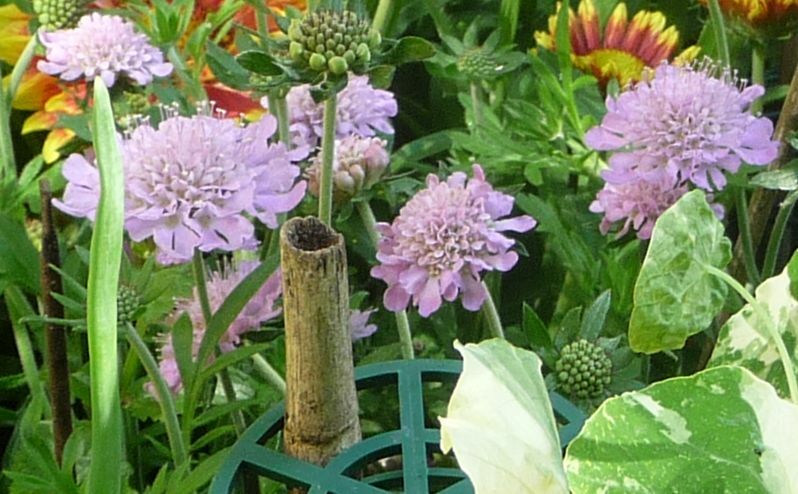 Scabiosa provide foodplants for the larvae of species of Lepidoptera such as the Grey Pug Moth and Marsh Fritillary. From Marc Carlton’s list of preferred plants for bringing in the pollinators, Long Version. The Pincushion Plant also grows in Europe and Asia, and there are a number of named cultivars. It was brought to Europe from Hungary and Mediterranean Russia in about 1800 and has been cultivated ever since. 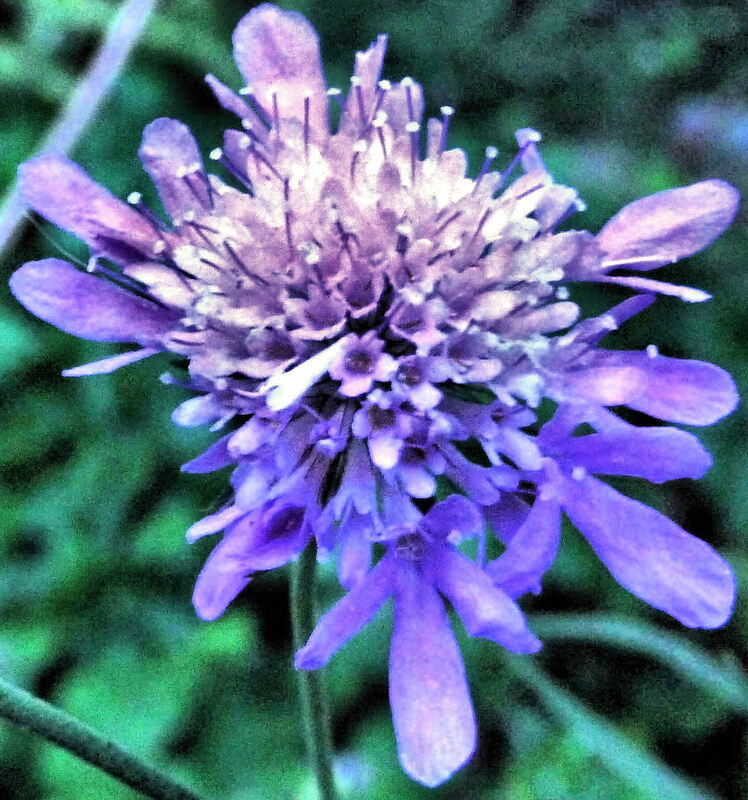 The name Scabious is from the Latin ‘scabere’ (to scratch) and refers to the medieval belief that plants of this species cured afflictions of the skin, from scabies to Bubonic plague. Culpeper said that Scabious roots, made into an ointment, were helpful in treating wounds, swollen throats, snakebite and the plague. 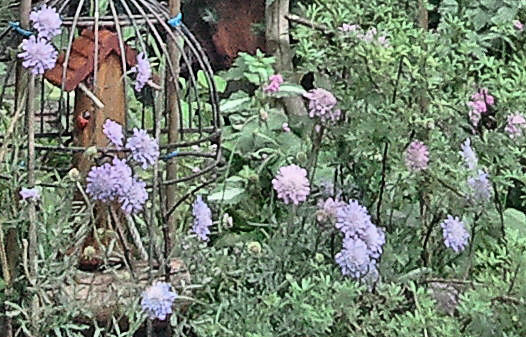 Small Scabious can be dwarfed by more robust plants taking over its space and sunshine, as we discovered here when its neighbour, Hardy Geranium Wallichianum ‘Buxton’s Variety’, climbed all over it. We had to separate them in the end, with Buxton’s now living in a tall container. 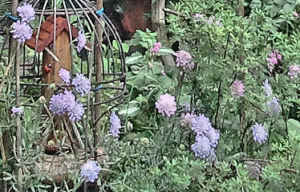 Other names: Corn Scabious (Culpeper), Dove Pincushion, Pigeon Scabious, The Pincushion Plant.